Angela Merkel and Europe’s twin crises: Can the German chancellor solve the crisis in Greece and Ukraine simultaneously? 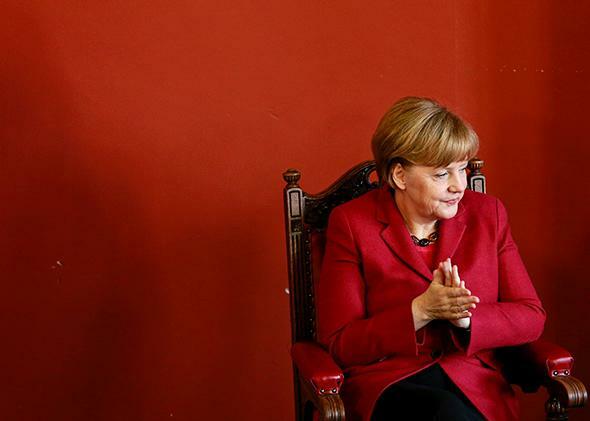 We may regret letting the German chancellor be the key to solving Europe’s looming crises in Greece and Ukraine. Germany now dominates negotiations with Russia over Ukraine because German Chancellor Angela Merkel thought she could resolve the crisis through her personal contacts with the Russian president. Above, Merkel in Dublin in March 2014. It’s either an extraordinary coincidence or an act of fate. Over the past 10 days, two unusually dangerous crises have come to a head in Europe. One concerns Greece, where an unresolved economic disaster could lead to a European and even an international financial crash. The other concerns Ukraine, where a Russian invasion could lead to a European and even an international war. They are very different, but in one sense similar: Both of them hang on the decisions and diplomacy of the German chancellor, Angela Merkel. How did this happen? In the case of Greece, it’s not hard to understand. Greece’s economic troubles are in part the result of its own bad decision to subject its weak economy to the rules of the eurozone. Germany, meanwhile, is the largest, richest, most dynamic economy in the eurozone. Germany’s taxpayers support the European institutions that lend public money to Greece, and German banks owned much of Greece’s private debt, too. When the Germans declare they will not allow Greece to change the terms of its bailout package, everybody listens. On Friday, Greece seemed ready to agree, despite weeks of protest. In the case of Ukraine, the story is rather different. Since World War II, Germany has had no serious foreign policy record and no cadre of diplomats accustomed to solving foreign crises. Germany has no army to speak of either: At a recent NATO exercise, German troops were so badly equipped that they used broomsticks instead of guns. The Ukraine crisis actually began because Ukrainians demonstrated—and risked their lives—in hopes of drawing closer to the European Union. But although the EU theoretically has a foreign-policy function, in practice it barely exists, not least because Germany first weakened it and now ignores it. But even without the EU, Germany could have created a Western contact group for Ukraine—including the United States and perhaps Britain, France, Poland, or the Netherlands—that would have had real defense capability and real foreign-policy clout. Instead, Germany now dominates negotiations with Russia over Ukraine because Merkel thought she could resolve it through her personal contacts with the Russian president, Vladimir Putin. After dozens of telephone calls failed to achieve anything, she flew to Minsk, Belarus, with the French president in tow as a kind of fig leaf, to negotiate a cease-fire, which also failed. Instead of ceasing to fight, Russian-backed “separatists” this week launched an offensive and took over the town of Debaltseve, Ukraine. Merkel’s modest demeanor, and possibly her gender, have made German power easier for others to tolerate. But German power has also been palatable for the past half-century because it was always exercised in concert with others. At the time of the eurozone’s creation, it was tacitly understood that Germany and France would run it, in conjunction with the rest of the participants. But since the financial crisis of 2009 weakened Italy, Spain, and France, Germany has dominated eurozone financial politics because nobody else can. Apparently, no one is able to help manage Europe’s security crisis either. Nobody ever imagined a world in which Germany would be negotiating directly with Russia—or that France would be too weak, Britain too inward-looking, and the United States too uninterested to object. The risks, both for Germany and for everybody else, are high. If the Greek financial crisis ends in fiasco and a Greek withdrawal from the eurozone, the backlash against Germany could turn into a backlash against all of the European institutions that Germany is perceived to run. The risks in Ukraine are even greater. Merkel has put her personal stamp on a cease-fire agreement she cannot enforce—and if it fails, there is no Plan B. She has, it is true, hinted at one: Ukraine could give up its eastern provinces, build a “Berlin Wall” around them in the form of a demilitarized zone, tighten its borders, and gain time to rebuild its state. But for that plan to work in the longer term, the West would have to treat the rest of Ukraine like it once treated West Germany, reinforcing it economically, politically, and militarily, in order to deter Russia. Right now, there is no sign that Germany or anyone else is prepared to do that. Instead, Ukraine will lose control of Donbass to Russian proxies whom Russia can then use to further destabilize the Ukrainian state, perhaps to take more territory, perhaps to threaten NATO. The Russian president is limited by his failing economy—but then, thanks to the Greek crisis, Europe may soon be limited by its failing economies, too. If the two crises peak simultaneously, Germany’s moment of unexpectedly solitary power may soon begin to look like Germany’s hubris instead.